It can be a hassle to think of how to spruce up your packed lunch to school or work every day. Most days, it probably consists of leftovers or a basic sandwich that you whipped up in under five minutes. Some days, we crave for something more and it is unfortunate that we might not have time to run down for a takeaway lunch. But there are so many things that you can whip up in 10-15 minutes for your meal(s) the following day and all you need is some vision and creativity. We experimented on a few ways to spruce up a healthy salad meal and came up with these very simple recipes that you can do with a jar. 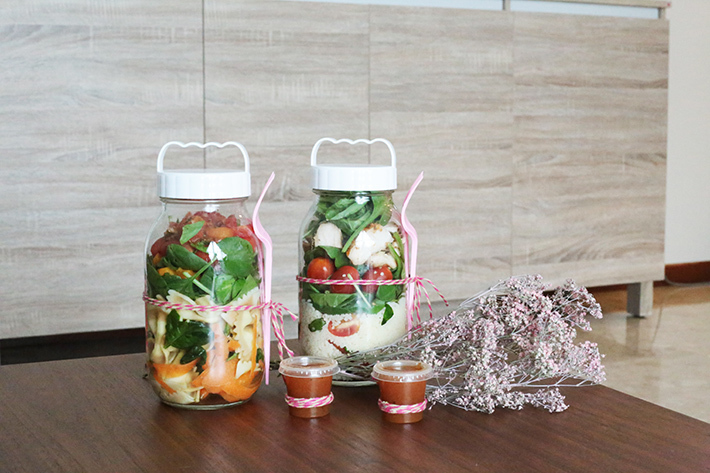 Here are 2 Easy Salad in A Jar Recipes To Prepare For a Meal For School or Work. Baking might not be the easiest thing for many of us. We have had our struggles trying to ace that perfect cheesecake, and you bet we are always trying to find ways to make our lives easier with simple and fool-proof recipes. Clueless people can opt for no-bake recipes, like we did with this one. To jazz it up bit, we decided to swirl in some colours to our no-bake cheesecake for an extra oomph. You can finish off your cheesecake or serve it in any ways you like. We chose some rainbow sprinkles, but you could even whip up a nice berry compote or squeeze some whipped cream on it. Here is an Easy No-Bake Tie-Dye Rainbow Cheesecake Recipe. Moms are always so dear and important to us. And on her big day, dedicate the day to her and let her have the most memorable Mother’s Day. Bring her to her favourite restaurant(s), spend quality time together with her and your family, or just simply hang out with her and taking part in her favourite activities. Whatever it is, you need to plan your day right – for her. Bring her flowers then take her out on a “secret trip” – a pampering spa treatment, a meal at her favourite restaurant or maybe even crafting sessions. Then, end the day off with a nice family feast. Plan your day the way you know your mother will love and appreciate. After all, she deserves it. And we are here to help! No clue on what to do this Mother’s Day? Here is a list of 10 Fun Activities to Do in Singapore With Your Mom This Mother’s Day! We stumbled upon a recipe recently that looked almost too good to be true – Deep-fried mochi balls with a molten chocolate centre. And the best part? The recipe is so simple. It took us approximately 10 minutes to prepare and cook these. From the crisp exterior, to the chewy mochi outer layer, and the star of the show – oozing chocolate in the center; it is a winning combination. We are glad we tried it, and we can’t wait to share the recipe with you! It takes pretty much no time at all to achieve these amazing bite-sized treats. Here, we present Easy Deep-Fried Mochi Recipe With Oozing Molten Chocolate Center! 20F Specialty Coffeehouse is a cafe that sits in the Jalan Besar neighbourhood, and is especially cosy with 4 separate sitting areas. The cafe gets pretty quiet after meal times, so that is the best time to visit if you want to snap some great photos quietly or to read a book in peace with a cuppa. 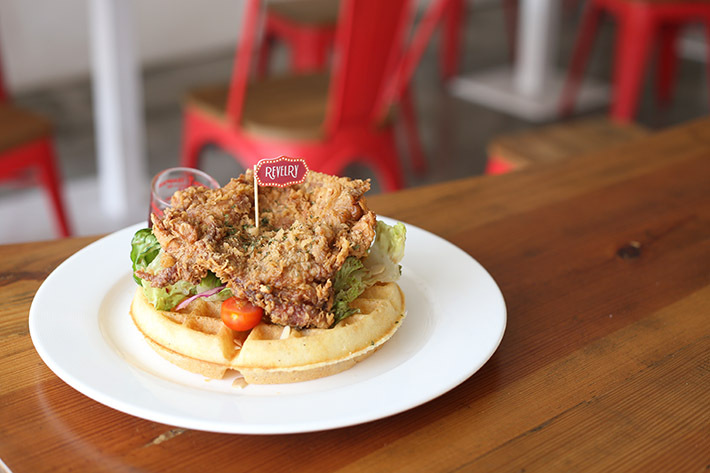 We dived right for the most unique (and popular option) here – Duck & Waffle (S$22), part of their all-day brunch menu. The duck confit is served alongside fluffy buttermilk waffles, strawberry compote and mixed berries sorbet. It might seem odd to some that sweet and savoury are mixed together, and you will either love it or despise it. Let’s face it – colourful food/ snacks/ desserts always get our attention. Whether they are bright or pastels, be it the popular Rainbow Bagels or Tie-Dye Pastel Macaroon Ice Creams, we are always drawn to these out-of-the-norm food that are super pretty. Entrepreneurs are starting to see the trend in pursuing ideas similar to this. Fairyfloss, a brand new snack concept, is one. 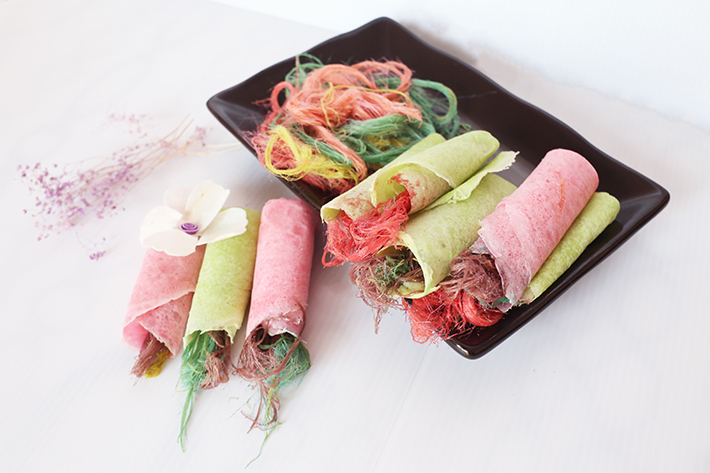 They try to be different with their rainbow Roti Sai Mai that are really colourful crepes that are actually already a popular snack in Thailand. Essentially a well-loved cotton candy treat in the country, Fairyfloss gave theirs a magical touch and because we are suckers like that, you have this story to read today. So what exactly is this Rainbow Roti Sai Mai that you should totally get your hands on? Squeezed! started off as a kiosk serving cold pressed juices at both Leisure Park Kallang and Suntec City. Their spanking new outlet at Waterway Point in Punggol kickstarted the launch of the signature stuffed brioche buns that range from sweet to savoury creations. Besides the 6 signature buns flashed on the overhead menu, you can also grab a ‘Naked’ (S$4.30) and original Squeezed! bun filled with froyo only. This unique concept has been making waves on social media lately and we just had to have a go.